Bell’s palsy is a condition which makes muscles on one side of your face weak or paralyzed. Only one side of the face is affected at a time. Because of Bell’s palsy there may be drooping or stiffness on the affected side, smile may be one-sided and you may find closing the eye on that side difficult. However, the exact cause of this condition is still unknown, but it is believed that the swelling and inflammation of the seventh cranial nerve leads to this condition. It is also known as “facial nerve”. This nerve passes through a narrow, bony area within the skull. When the nerve swells, even a little bit, it pushes against the skull’s hard surface. This affects how well the nerve works. Anyone can fall prey to Bell’s palsy but generally people suffering from diabetes or those who are recovering from viral infections are prone to this disease. Medical studies show that herpes simplex 1 virus may be responsible for a large number of cases. It is often mistaken as a stroke. An easy way to differentiate between Bell’s palsy and stroke is in the latter the weakness affects not only in the facial muscles, but in the other parts of the body as well, whereas in Bell’s palsy the weakness is largely restricted to the facial muscles. 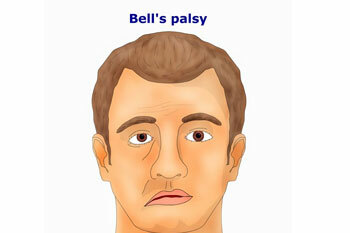 In Bell’s palsy complete recovery from the symptoms happens in about six months with proper rehabilitation. Symptoms may continue in small number of people for life. Rarely Bell’s palsy can recur — suggesting a possible genetic predisposition to the condition. Symptoms of Bell’s palsy can happen all of a sudden. You may be feeling alright when going to bed at night, but when looking in the mirror the next day, there is drooping on one side of the face. In some people one to two days before the onset of symptoms, they feel pain behind their ears. You may find the following changes in your body before the symptoms of the disease become apparent. Remember, these symptoms appear only on one side of the body. A mild bout of Bell’s palsy may abate within a month. Recovery from a moderate-to-severe Bell’s palsy may take a prolonged time. Complications include that your facial nerve may be irreversibly damaged, involuntary contraction of muscles due to abnormal growth of nerve fibers, partial or complete loss of vision of the eye on the affected side because of excessive dryness and damage of the protective covering of the eye (cornea). Diagnosis of the condition is tricky as there is no test that can prove conclusively that you have Bell’s palsy. Usually, the diagnosis of the condition is made by following a technique called “diagnosis of exclusion”. That means arriving at a diagnosis by ruling out the presence of other conditions. A complete and close physical exam is the first step when a patient is taken to see the doctor, where the patient will try to close the eyelid on the affected side. If it doesn’t close, it could be that you have Bell’s palsy. Treatment for the condition primarily depends on what caused the disease. If your doctor finds out that the symptoms are triggered by the herpes virus (herpes simplex 1) or by shingles (herpes zoster), he may give you an antiviral medication, like acyclovir. This may bring down the intensity of the Bell’s palsy symptoms. Meanwhile, your doctor will advise you to take extra care to protect the eye on the affected side. An eye patch may be recommended as you cannot blink. In order to moisten the eye, using an eye drop is beneficial. To speed up the recovery, physical therapy plays a key role. The physical therapist guides you through special exercises which are designed to help you relearn facial movements depending on the specific movement problem that you have. Facial correction splint is customized and provided by the occupational therapist which promotes early recovery.